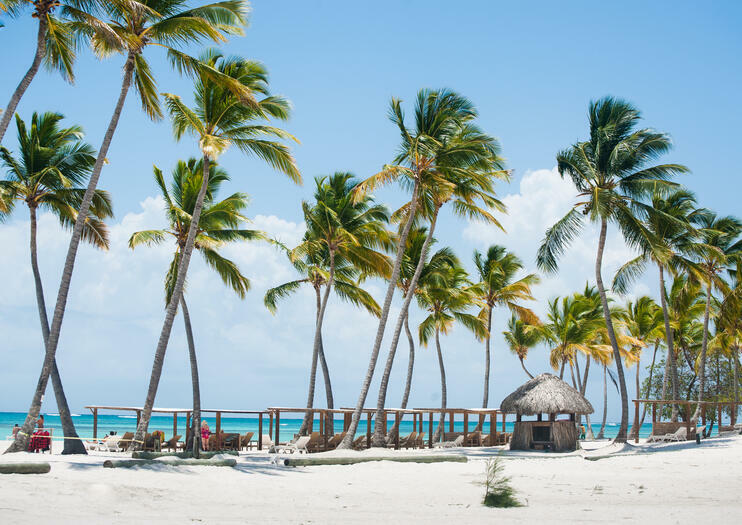 A former fishing village on the east coast of the Dominican Republic, Juanillo Beach is today one of the region's most desirable stretches of white-sand beach. Wide open, powdery soft, and lined with palm trees, this stretch of sand runs from Cap Cana Marina to the Sanctuary Cap Cana Golf & Spa Resort. While open to the public, the beach is only accessible through Cap Cana Resort, making it a calm and quiet place to soak up some rays. A hidden gem in Punta Cana, Juanillo Beach is far less frequented that more popular stretches of shore in the area, meaning it's a nice spot to avoid the crowds. Travelers based in Punta Cana without a rental car can visit this sleepy beach on a full-day catamaran cruise, which includes a chance to swim or snorkel in the crystal clear waters of one of the nation's hidden cenotes. This beach is a must-visit for sun seekers and families. Remember to bring your ID; you might need it when entering Cap Cana Resort. Cabanas and loungers are available for rent along the beach. Public restrooms are not available on the beach. Juanillo Beach is located in Cap Cana, about 15 minutes from Punta Cana International Airport by road. The easiest way to reach the beach is by taxi or on a catamaran ride from Punta Cana. There isn't really a bad time to visit Juanillo Beach, though it can get lively when special events are taking place, usually on the weekends. The weather is warm and beach-worthy year-round, though hurricanes are somewhat of a threat in the Caribbean between June and November. Warm, shallow, blue waters create a natural swimming pool at this beautiful beach, ideal for swimming and sunbathing. It's also a destination for windsurfing when the weather allows. If you plan to windsurf, snorkel, or partake in any other water sport, be sure to join a guided excursion or bring your own equipment, as rentals are not available on the beach. Cruise around the waters of Punta Cana aboard a private catamaran. During this 3.5-hour tour departing in the morning or the afternoon, learn about the culture and history of the Dominican Republic from your local captain. Explore the island's white sand beaches and see the underwater world during stops for fishing and snorkeling. Visit the Juanillo Natural Pool, see the luxurious resorts and villas as you cruise up the shoreline and go ashore to have a look around the Plaza de Pescadores and Fishing Lodge. Round-trip transportation from select Punta Cana hotels is included.